Let's take the temperature of the running back room following a spring game in which the Huskers ran wild. Should we start by looking at the run numbers? One set is from a year everyone wants to forget and another is from a game no one will remember in a year or two. Nebraska is known for running; last season it wasn’t; this season people are hoping that pendulum swings back. If we’re going to dissect the actual game itself, the rushing numbers are a good place to cut into. Over the course of the entire game, Nebraska ran 138 plays, 73 of which were run plays. (Last season Nebraska ran 135 plays during its spring game, of which 37 were runs.) That’s a 5.3 yards per carry average. That’s better than all but one game last season — the opener when Tre Bryant racked up 192 yards. Success in 2018 could very well depend on the offensive line (though the scheme might help a bit) but it seems like the Huskers aren’t short on guys that can fit and fit well in this scheme. The Red team alone rushed for 298 yards (adjusted for sacks) and had three backs break the 50-yard threshold. Let’s start with junior college transfer Greg Bell, who piled up 54 yards on eight carries with three explosive runs and another 41 yards receiving on two catches. Among the 28 total games between last year’s four main backs, Bell’s 6.8 yards per carry would have been the highest average for a single game. Watch the patience as Bell waits for something to open up, then the shot-out-a-cannon speed to accelerate through the line and pick up a decent gain. That cut at the end also nearly forces safety Marquel Dismuke (19) to miss. Here the line does its job, the quarterback option element freezes end Chris Walker (55) and Bell does the rest. Of all the backs, Bell might have the most breakaway ability. Dismuke takes a bad angle and Bell flies by. Here we’ve got Bell out of the backfield and then Bell turning a play with the potential for nothing into a lot of something. The screen pass is pretty plain; ideally, you’d like to see him wait for lineman Jerald Foster (67) and tight end Matt Snyder (85) to set up their blocks downfield but Bell’s got speed to burn and just outruns linebacker Andrew Ward (52). After the game, Bell said he wants to work on his speed this summer. So, like, have fun other Big Ten defenses. Senior Mikale Wilbon was also pleasantly surprising. The assumption when the new staff recruited the likes of Bell, Maurice Washington and Miles Jones (both yet to arrive) was that the elder statesmen — Wilbon and Devine Ozigbo — would get pushed out. Wilbon was the first back on the field for the Red team Saturday. He tallied 54 yards on 10 carries. The 5-foot-9, 200-pound I-back says he added 15 pounds of muscle this offseason and now just needs to get into game shape. Wilbon might end up being a factor in this rotation after all. Now for the wild-card: sophomore Jaylin Bradley. I wrote a few weeks ago about Bradley’s pursuit of the top running back spot in an offense that fits him well and moving forward from a seldom-used, often-forgotten freshman campaign. Saturday showed the talent that keeps him exciting, but also that he might have a similarly difficult task getting on the field this year. He had 18 yards on seven carries — not great numbers — but did have an eye-catching run in the second quarter against the first-team defense. Bradley jukes linebacker Tyrin Ferguson (43) out of his shoes and slaps his arm tackle away for an added level of sauce. He runs right into defensive lineman Carlos Davis (96), effectively ending the play, but for a first-down carry in the red zone, Bradley keeps things on schedule. Junior walk-on Wyatt Mazour also had another strong spring game with 52 yards and a touchdown on four carries. In the last two years, he’s got 109 yards and two scores on eight carries in the scrimmage. Mazour showed a nice burst on his 43-yard score. He looks like a guy that could and should see the field. The guy that hasn’t been looked at: Ozigbo. Ten carries for 22 yards will do that. Granted, Ozigbo was going against the defense’s best, but the minimal production falls in line with what he did last season. Ozigbo led the team in rushing but didn’t top 500 yards. His 3.82 yards-per-carry average was the worst of the four main backs and there just isn’t a ton of excitement about his game. He’s big and strong and can move a pile a yard or two, but most of Saturday’s run schemes were misdirection runs to open up space on the perimeter. There’s just not going to be a ton of power or dive plays in this offense. He might get goal line carries but there were none of those to be found Saturday. Production-wise, 298 yards from a Husker side would have been a season-best last year, and it wouldn’t have been particularly close. The best day came, again, in the opener. On six occasions Nebraska failed to top 100 yards on the ground. The 45 attempts for the Red side would have been the second-most, only behind a 47-carry day against Rutgers. 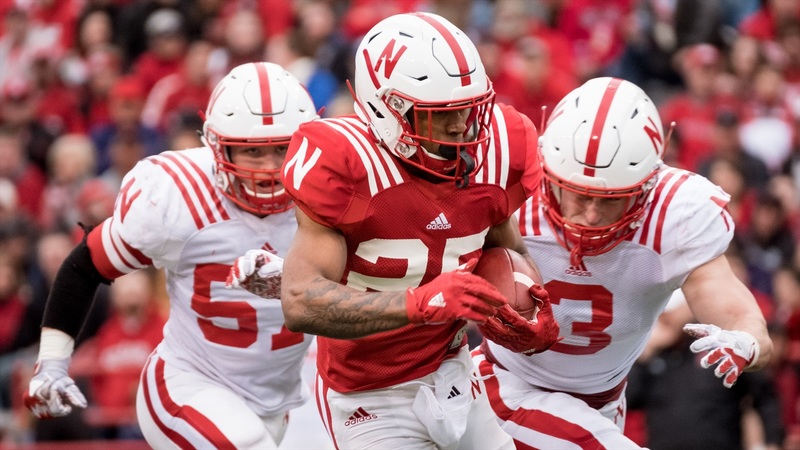 The 1,000-yard problem might not be over — Nebraska appears to have a number of capable guys in the backfield, and we’re not even factoring in sophomore Tre Bryant — but at the very least, fans might not have to endure another overall rushing campaign like last year.